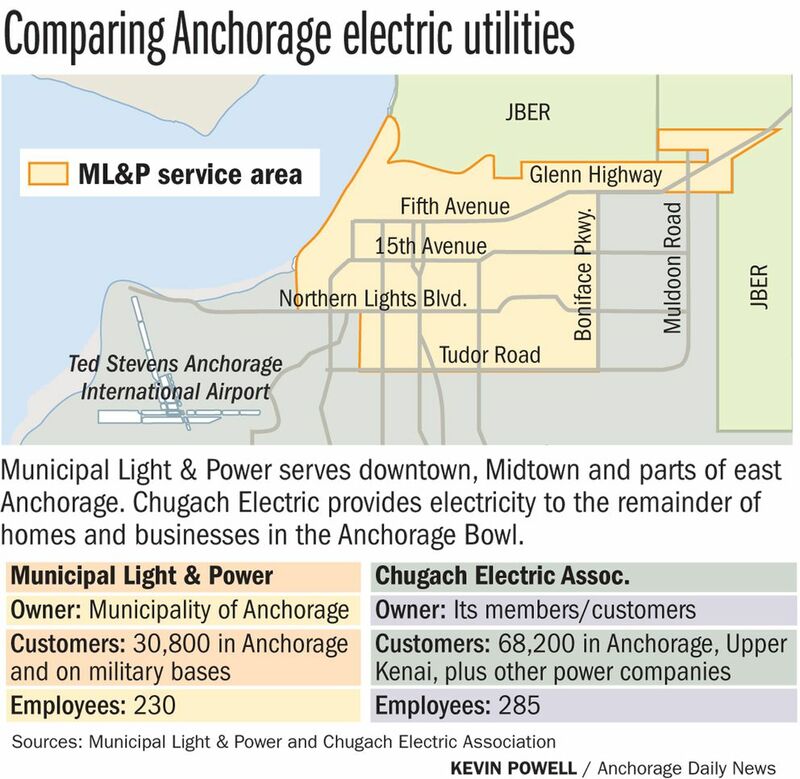 Anchorage Mayor Ethan Berkowitz is proposing to sell the city-owned power company that serves the downtown core, Midtown and parts of East Anchorage to Chugach Electric Association, the member-owned cooperative that covers much of the Anchorage Bowl. The proposal was announced Thursday morning jointly with power company executives and will require a series of steps, including voter approval, to take effect. "It is a very big deal," Berkowitz said in an earlier briefing. The estimated price tag: about $1 billion. No employees would be laid off, rates wouldn't go up and taxes wouldn't go up, the mayor said. 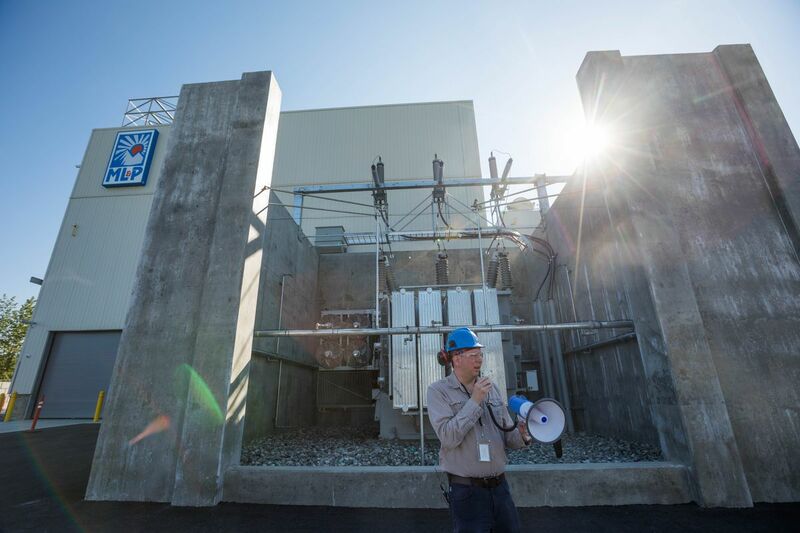 By consolidating services and staff with Municipal Light & Power, Chugach Electric would save hundreds of millions of dollars over a number of years and rates would eventually go down, said Lee Thibert, Chugach CEO. A merger or sale of 85-year-old Municipal Light & Power has been talked about for decades. Pressure increased in 2016 when ML&P proposed rate increases that took effect earlier this year. Businesses went to the Anchorage Economic Development Corp. with concerns about the cost of electricity in town. The business organization created a utilities working group that concluded having two electric utilities for a city of about 300,000 people "has resulted in inherent inefficiencies that are creating growing costs for ratepayers." In June, the Anchorage Assembly passed a resolution that urged the city, ML&P and Chugach Electric Association to begin looking at a merger. A merger would be harder to execute than an outright purchase, Thibert said. For Chugach, it would require a supermajority of cooperative members to participate in a vote – many more than the portion who usually take part. So the effort evolved from possible merger to possible sale. For a sale to happen, the Anchorage Assembly would first need to approve a ballot proposition that would go before voters in the April city election. Voters would then have to approve the sale. A detailed sales document then would be hammered out and sent to the Regulatory Commission of Alaska, which would have six months to consider it. The sale, if all approvals come together, would happen in early 2019, officials said. "Right away what we will guarantee is we will not have a rate increase," Thibert said. "What we're looking at is over time, the transaction will result in hundreds of millions of dollars' worth of savings. So you will see rate reductions over time." The savings come by combining staffs and headquarters and eliminating duplication of services in areas such as preparing for rate cases before RCA. Of the $1 billion, $524 million would pay off ML&P's debt, according to Chugach officials. 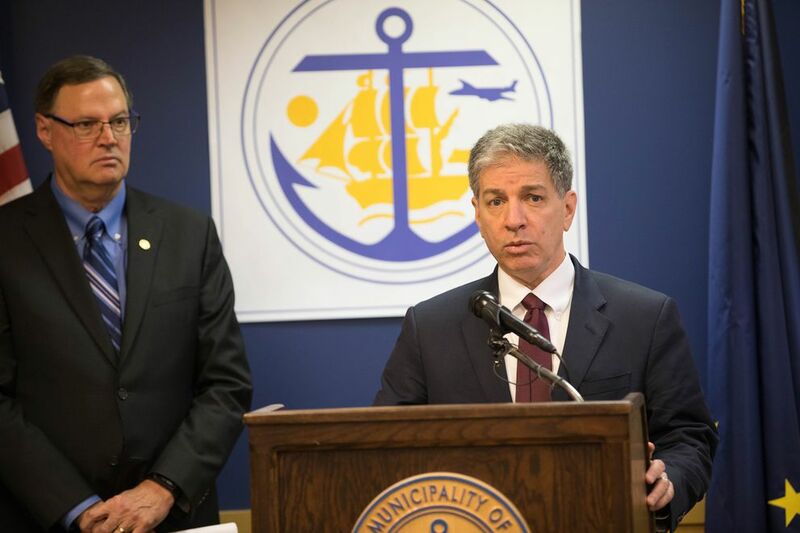 Another $170 million would be paid in a lump sum that could go into a city trust account – a sort of municipal permanent fund that helps pay for some of city government, Berkowitz said. Chugach would make payments to provide an additional $170 million over 30 years. And the utility would also make payments in lieu of taxes that over time would amount to $142 million, Thibert said. Peak demand times are different for the utilities, with ML&P seeing peak usage midday and Chugach, in the evenings. Combining would moderate those peaks, managers said. With interest rates low, the timing is good for Chugach to finance a sale, Thibert said. Chugach is a nonprofit cooperative and its members share in profits. Berkowitz said other potential buyers expressed interest but the city wanted to keep the operation nonprofit. The city has agreements not to disclose the other potential buyers, officials said. Thibert estimated that the savings would cut 8 to 12 percent of Chugach's non-fuel expenses. "That goes on forever," he said. The total number of employees would shrink over time, through attrition. Both utilities have vacancies they have been unable to fill. Mark Johnston, general manager of ML&P, said the city power company has been trying to hire a meter installer for a year and can't find one. As it is, both utilities are competing for the same workers. ML&P and Chugach currently generate about the same amount of power. Chugach covers a much larger geographic service area, but the city utility provides electricity for many big businesses. ML&P has 230 employees and Chugach has 285. Most of the front-line workers for both utilities are in the International Brotherhood of Electrical Workers union, so pay scales are similar. But the management at Chugach makes more than ML&P, officials said. In an emailed statement on Thursday that referred to the June resolution about a possible merger of the utilities, IBEW Local 1547 business manager Dave Reaves said much has yet to be determined. "We recognize that there are many details still to be worked out and urge both parties to give mindful consideration of the impact any agreement may have on the more than 500 employees and their families," he said in the statement. When asked via email about the union's stance on the deal, the local's communications director, Melinda Taylor, said "we'll continue to evaluate things as we receive additional details." The two utilities already jointly own power plants and also have their own plants. Rates are "fairly competitive" between the two organizations, Johnston said. "It won't be a huge difference to be able to consolidate those rates between Chugach and ML&P," he said. Some customers of the Matanuska Electric Association also fall within the municipality, and Berkowitz said the city will also see that those customers benefit from the deal. The city previously had its own telephone company but sold it in 1999 to what is now Alaska Communications. The U.S. has about 2,000 public power utilities, most of them owned by municipalities, according to the American Public Power Association. ADN reporter Annie Zak contributed to this story.